I’m not the techiest of guys when it comes to speaker systems. All I every really need is a system that’s easy to use, can play my music loud, and can bump basslines. I’ve collected folders upon folders and drives upon drives of mp3s, and now my music system requirements are a bit more sophisticated. I want something that can play mp3s from my computer, that I can control with a remote, and that can be played in multiple rooms, even my back patio. I’ve pretty much found the music system that meets all these requirements: The Sonos S5 Wireless Music System. ($399) This thing is pretty effin’ sick. Like I said, I’m not that techy, so I won’t go into the specs. What I can say is that YOU CAN PLAY MUSIC IN EVERY ROOM OF YOUR HOUSE! That’s a pretty big deal for me since my girlfriend wants to hear music while she’s cooking in the kitchen and I want to hear tunes while I’m waiting for my girlfriend to cook in the kitchen. The Sonos S5 lets you do this pretty easily. The setup wasn’t time consuming, but you do have to read the instructions. It pretty much consists of installing software on your computer, attaching the Zone Bridge to your router and then placing your Sonos speaker anywhere you want in your house. The thing is wireless so you can pretty much unplug it and move it to whatever spot you want. If you’ve got a lot of music on your computer and you want to have access to those files from anywhere in your house, this system does it easily. During setup, the installer will take you through associating your music folders or iTunes to your Sonos S5 system. If you want to listen to internet radio stations, Sonos lets you have your cake and eat it too. You can access thousands of free internet radio stations and broadcast programs. Just press Radio. Sonos S5 will also let you access your Pandora account and paid music services like Napster, Rhapsody, and Sirius. Check the Sonos site for updated music service listings. 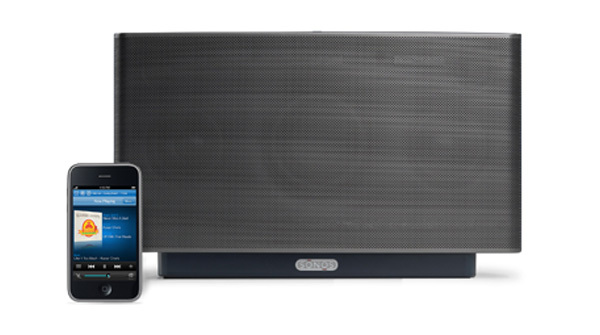 The cool thing about the Sonos S5 is that you can control your tunes with your iPhone or iPod Touch. Sonos provides a free app that turns your iPhone into a controller. If you don’t have an iPhone or iPod Touch, you’re going to have to cough up $349 for one the controllers that Sonos provides. It’s definitely a music system that’s best served with Apple devices if you want to keep the costs down. If you want to use headphones with the S5, no problem, there’s a jack in the back. There’s also a line-in jack if you want to connect a portable music player, CD player, or TV. So all in all, it’s a damn good music system. The sound is great, it’s small enough to move around to different rooms (if you don’t have the funds to buy one for every room in your place), and it’s easy to control. Did I mention that you can have different tunes playing in different rooms? With all the music you’ve stored up over the years, accessing your library from anywhere in your home is a pretty sweet deal. Print article This entry was posted by Mac Wilson on September 7, 2010 at 9:43 am, and is filed under Lifestyle. Follow any responses to this post through RSS 2.0. Both comments and pings are currently closed.